Crime Scene Clean provides reliable biohazard cleanup services in Louisiana for anyone requiring this type of cleaning and remediation. 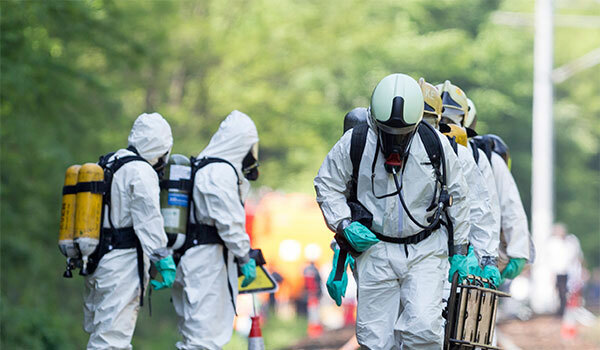 There are many safety hazards involved with biohazard cleanup, and our team of trained professionals are well aware of these hazards and take every precaution necessary to ensure that no one is at risk during the cleanup, removal, and transportation of these materials. We will come out to your location, wherever that may be, to remove your bio-hazardous waste and dispose of it properly. Whether you have a medical clinic, dental office, research laboratory, veterinary clinic, hospital, emergency response units, nursing home, school, any type of industrial business, or any other type of location, we will come out and take care of your biohazardous material. We are insured and bonded; so just give us a call today and let us know what you need us to remove or clean. We provide medical waste removal for Louisiana clinics, hospitals, nursing homes, dental offices, and more that require our services. We offer convenient pickups and drop-offs for red bag medical waste, available at the schedule that best serves you. We also will pick up and dispose of any needles and other materials used in medical procedures. If you have medical waste that needs disposal, regardless of what it is, give us a call today and we will schedule a pick up that is convenient for you. Crime Scene Clean provides reliable biohazard cleanup and removal to anyone who needs hazardous cleaning services. You can have peace of mind that when we come out to your location, not only will the materials be removed properly, but they will also be disposed of in the correct manner so that no one will get ill from them later on. We use unmarked trucks for discretion and will take every precaution so that no one is at risk from the biohazardous materials. We are also insured and bonded. We provide our 24/7 bio-hazardous material removal & cleanup services to all Louisiana cities including Shreveport, Alexandria, Lake Charles, Lafayette, Baton Rouge, and more. Contact us today and let us know what you need.